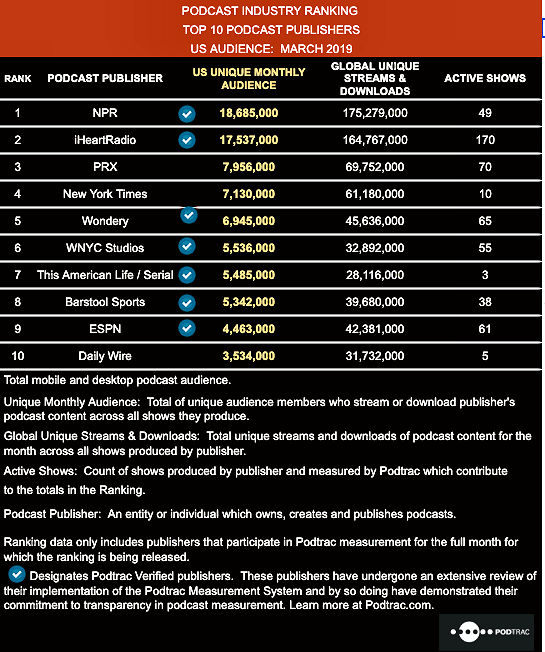 The top 10 Podcast Publishers ranking and the top 20 Podcasts ranking for March, 2019 are now available. During the March Publisher ranking, seven of the top 10 publishers showed increases in their U.S. Unique Monthly Audience (UMA) over February with the largest increase coming from PRX (14%) with the merger of PRI shows. Average U.S. Unique Monthly Audience across the top 10 publishers of 8.2 million is up slightly (1%) from February, 2019 and up 43% from March, 2018.